← Have you tried a bit of rough puff yet? 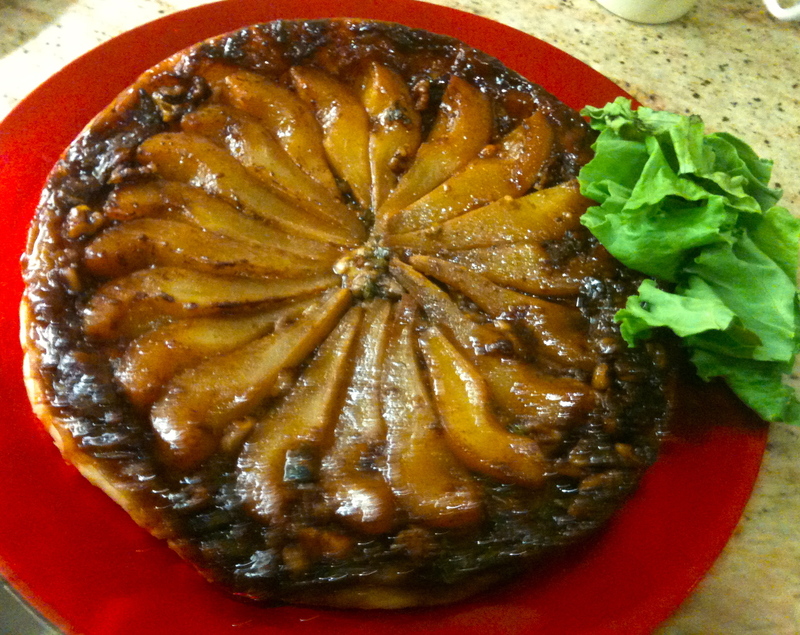 Savoury Pear Tarte tatin was the title before it got changed. One of the odd things about Bake Off is that we were encouraged to think up interesting titles for our bakes, that in the end often got changed into simple descriptions of the ingredients. This was one of the few occasions in Bake Off when I made something we had eaten several times before and I knew worked. My brother in law Keith (aka the Don Corleone of Oxford allotments) makes the best apple tarte tatin I and many others have ever eaten. He won’t give the recipe away, other than admit it involves some cooking of the apples in Calvados he gets cheap from a French supermarket. So with no recipe and the taste of that sublime sweet tarte tatin in my head, when this recipe request came in, there was no way I was doing a sweet one and inevitably that meant a savoury one which I could practice and eat for tea after. As Jamie O would say, “bish bosh, job done”. This one combines all the 3 flavours that Richard (my partner at the time) likes and we have eaten it several times at weekends with salad. (Ps Sorry about the photo quality, but at the time I was photographing for presentation ideas never thinking I’d blog about it all). Use lots of lemon thyme if you have it- the suggested amount is a starting point and it will take much more. Don’t use posh pears. The hard conference ones that come as BOGOFs are perfect- use them at the rock hard stage and they will be fine when cooked. Any softer and they’re mush. and this really very good visual from Jamie Oliver’s website. Finally my slightly odd Meg Ryan jumping up and down when it turned out. Well I burnt my handle-less Le Creuset tatin pan and had to use one supplied by them on the day which had a handle. I had never turned it out with a handle before and realised as I was doing it that doing it onto a plastic serving plate wasn’t the brightest of ideas. When it came out perfectly the accidental ‘yes’s’ came out. I looked up and there was Simon the cameraman getting it all on film. Do please try this tart. Adding in your own Meg Ryan oohs and aahs is purely optional. Put flour and salt into a large bowl and add the cubed butter. Cut the butter down to mix into the flour with a round bladed knife. Cut the butter into smaller and smaller pieces coating them in the flour. Do not let the butter melt into the flour. Add the lemon juice to the water and pour into the bowl. Continue to work with the knife until the dough comes together. Remove from the bowl onto a floured surface. Roll the dough into a rectangle with a floured rolling pin. The rectangle should be 3 times longer than it is wide. Fold the top third of the pastry down, and the bottom third of the pastry up to meet it like folding a letter. Press the edges with a rolling pin. Rotate the pastry through 90 degrees and make 3 shallow depressions with the rolling pin to keep the edges straight. Roll into a rectangle again. Mark the pastry with a knife blade to allow counting of folds. This is fold one. Repeat the process of folding and rolling again for fold two, then place to rest in the fridge/freezer for 10 minutes. Repeat the rolling and folding a total of 6 times, resting in the fridge for 10 minutes again after fold 4. Wrap the pastry in clingfilm and chill for 1 hour if possible. Stand at room temperature before rolling out. Draw round and cut out a circle around the tatin tin to ensure the pastry is slightly larger than the tin. Peel, half and core the pears and allow to dry in room air. It doesn’t matter if they go brown as they are being caramelised. Cut each half into 3. Heat the sugar gently over a low heat in the tatin pan until it turns golden, swirling to melt but do not stir. When the caramel is golden, turn up the heat and add the butter and vinegar. This will bubble for 1 minute releasing vinegar fumes, then remove from the heat. 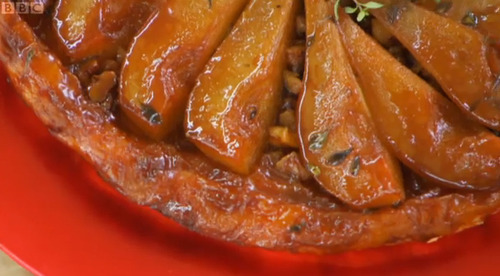 Arrange the pear slices in a fan with the narrow ends of the pear slices at the centre of the pan and the larger ends at the edges of the pan and sprinkle the walnuts and thyme on the caramel. Crumble the cheese over. Roll out the pastry on a lightly floured surface to be larger than the tatin pan. Roll in a square shape not a circle to keep the layers of the puff pastry. Use the parchment circle template to cut a circle of pastry slightly larger then the diameter of the pan. Lift the pastry over the filling using a rolling pin, tuck the sides down and make 2 knife pricks in the pastry to let the steam out. Bake for 30 minutes until the pastry is golden and puffed up. Put some water in the bottom of the oven as the tart goes in to make steam and encourage the layers to rise. Remove the tatin from the oven and rest for 10 minutes. Using oven gloves hold the serving plate over the tatin dish and invert. Remove the pan and decorate with sprigs of thyme. This entry was posted in GBBO, Recipes and tagged blue cheese, fruit, nuts, pear, puff pastry, vegetarian. Bookmark the permalink.